I am really interested in using OneNote more, I am already loving the ability to share between devices, but still want to utilise this application more. The higher the quality the longer the render time. You can also elect to include or omit audio. My third (and final) stylus arrived today, I certainly will not be going any cheaper. The balance feels right, and the overall length is not too short or too long. However the stylus is erratic when trying to take notes, and only surpasses the very cheapest of stylus in term of performance and at only a few pounds less than the Wacom Bamboo Solo I cannot recommend this at all (although it works very well on an iPad). It is useful only for moving around the interface when things are just a little too fiddly. 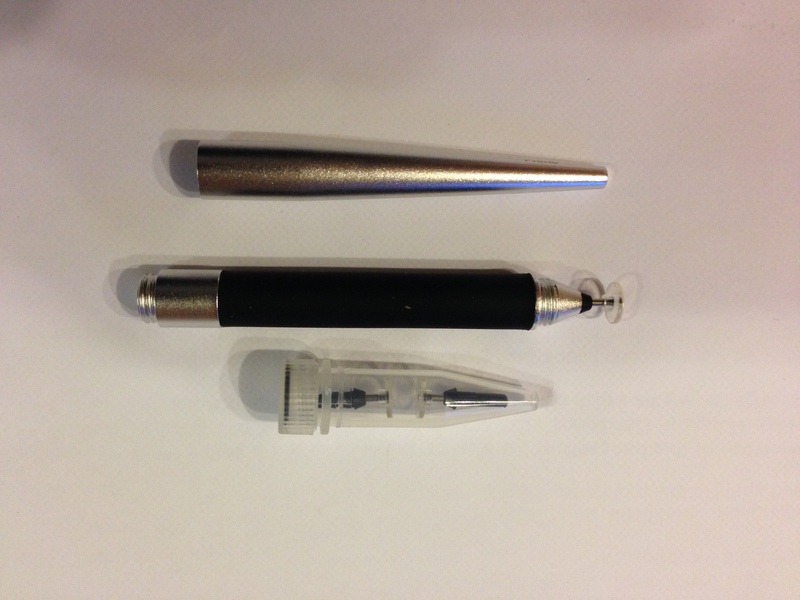 The stylus that unscrews to reveal the tip, the cap can then be screwed onto the opposite end to lengthen the stylus barrel. Most thing such as opening an app a fairly pointless with a stylus as they do not require any degree of finesse. 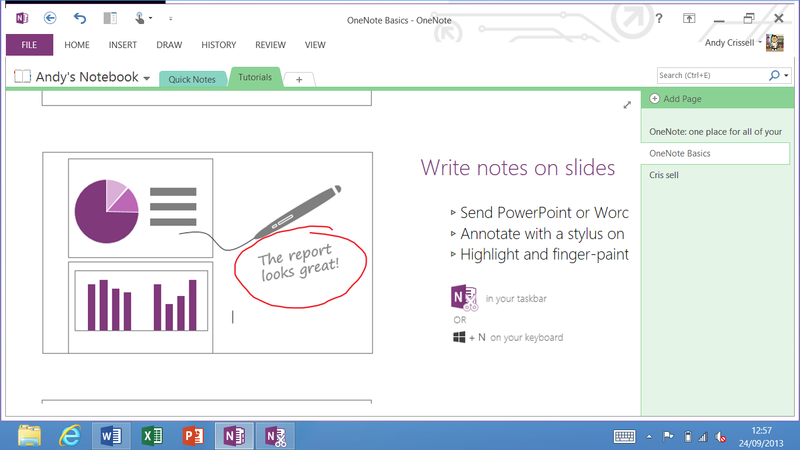 However when it comes to writing on OneNote (more on this in another blog soon) it really comes into its own. My handwriting has never been elegant and is maybe one of the reasons I ended up in the IT world, so if it can transfer my handwriting from stylus to surface and decipher it then a job well done! 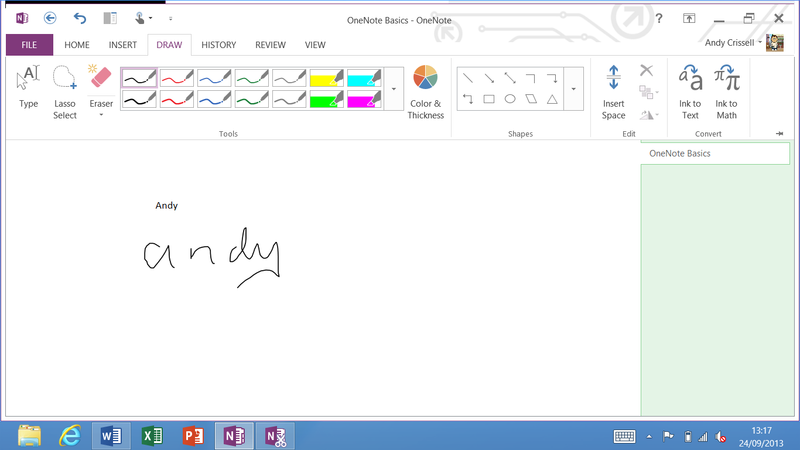 So as you can see from the screenshot above within OneNote by selecting the DRAW ribbon and selecting the first pen tool, with the screenshot below showing the result after selecting the “Ink to Text” option (on the far right of the DRAW ribbon). I am extremely happy with this stylus, it’s lightweight yet feels solid. The recognition is accurate with all but the exception of high-speed squiggles (where occasional gaps creep in) and the clear disc tip allows for accurate pin-pointing when dotting i’s and crossing the t’s. The tip also works at an amazing range of angles (many stylus suffer from restricted positions) and is at ease with the Surface RT being vertical or horizontal. update (11/09/2013): Just don’t put it on a table/desk that is less than perfectly horizontal – it rolls with a vengeance! So this blog entry sees me on a search for recommended stylus for the Surface RT. There is an absolute plethora of choices that range from the downright cheap and nasty to the expensive show pieces. I have already toyed with the really cheap ones on an iPad and they are extremely flimsy and lightweight, certainly they are not for anything other than casual and occasional use. The only ones I currently own are micro ones that are stored in headphone jacks and are acting as dust caps for my desktop (I’m not intending to us these for the Surface RT). So onto reasonable purchases for the Surface RT – be warned there is no outright winner. The Surface RT utilises a capacitive stylus, often characterised by a black sponge-like rounded tip not unlike a worn pencil eraser. This should not be confused with the Surface Pro stylus that can have 256 levels of pressure sensitivity and resembles a traditional pen and are far more expensive ( and accurate). The problems are that the width of the traditional capacitive stylus obscures the view of what you are/have written and they can ( given lots of use ) wear out by splitting rendering fixed all-in-one stylus useless. Griffin (£6) this is a cheap no frills functional stylus. When it wears out you buy a new one. If you find yourself using a stylus frequently this will cost you long term. Wacom bamboo (£13/£17 with built in pen) a traditional rubber domed stylus that is actually smaller than the majority of rubber tipped stylus that could be replaced with a good overall weight. Certainly top of the usual type stylus. Adonit Jot Pro (£20 with or without built in pen) this is the mac daddy of the stylus, it utilises a transparent plastic disc on a small ball joint so you can see where you have wrote for greater accuracy. It is accurate, it has a replaceable tip. But it is expensive and reports are out there that say it skips when making contact. The older models did not gave dampening so clunked when pushed onto the tablet surface. Bet well balanced. There have been reports of users adding conductive paste to the tip ball joint to improve performance as tips ages. 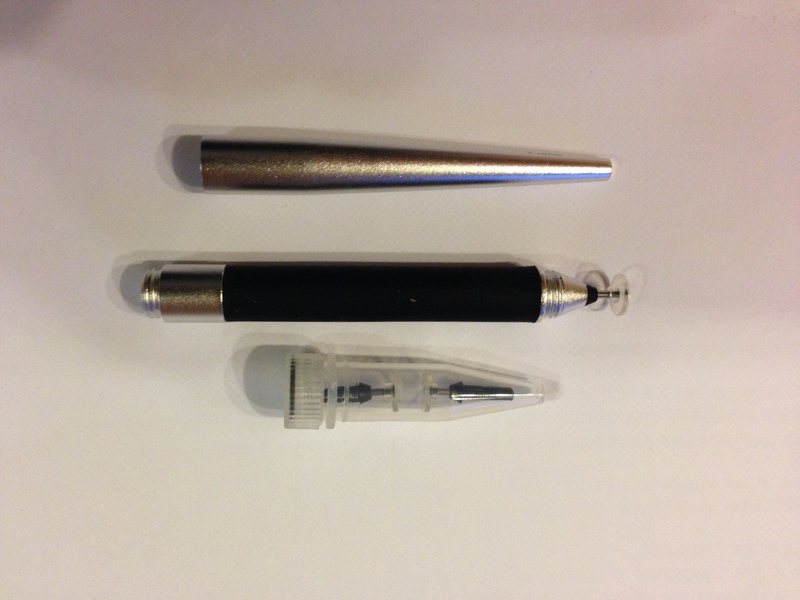 GoSmart Stylus (£20 standard or rocket finned body) this stylus seemed to have it all accuracy by utilising a wire crosshair that was coated and replaceable, style, reasonable price. However on contacting the manufacturer I was informed that the experience with the Surface RT is “hit and miss”! 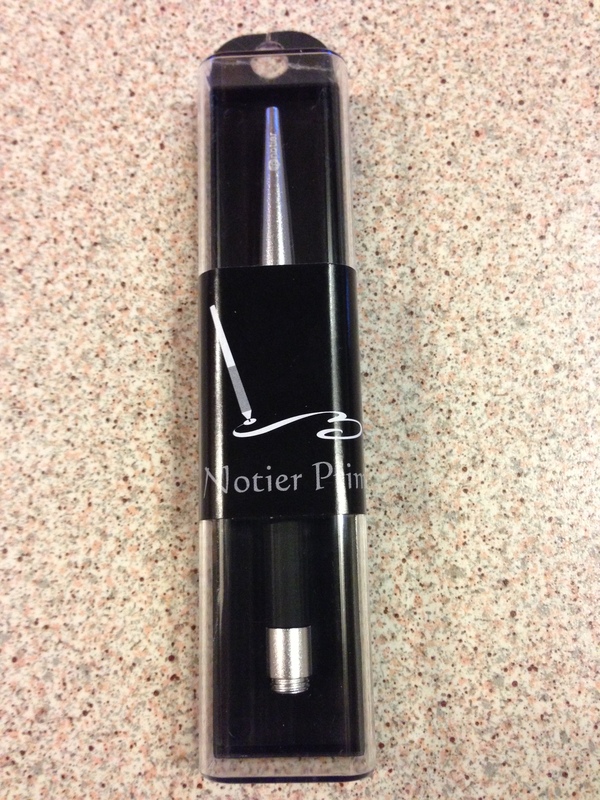 Musemee Notier V2 (£15 for V1) seemingly similar to the Jot Pro but far cheaper but still a good balance and a cap to cover the working tip for protection that screws onto the bet whilst in us. As with the GoSmart Stylus I could not find any comments of compatibility with the Surface RT so I contacted the manufacturer who confirmed it was. 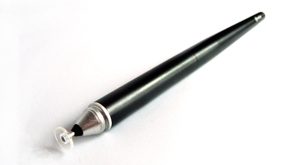 The original V1 suffered from design flaws in the joint from the tip to the stylus body. This has been superseded by a replaceable tip in V2. Unfortunately it is only available through their own website in the UK at the time of this post. I really think for anything non-fancy the Wacom bamboo would be ideal with its smaller and replaceable tips. So what do I really want? Well I really would like the Adonit Jot to work, but I don’t think I want to run the risk at its current cost. However I don’t want to compromise with the mini jot (£13) which is not as heavy and approx 5″. So I think the Musemee Notier V2 is going to be my choice for mid price and high accuracy with the fact in mind I’m only looking at hand written notes and not sketching or artwork. How that works out remains to seen.